French research and supply vessel Marion Dufrense ran aground in the morning Nov 14, 2012 in position 46 26S / 051 53E in a bay Cro-Baie du Marin, Possession island, Crozet Archipelago, Indian ocean. Vessel reportedly suffered a breach in a bow part, portside, two compartments and 5 ballast tanks are flooded. 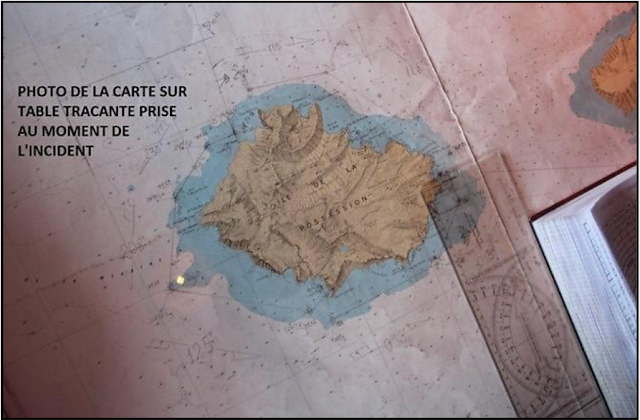 As part of her third mission of the year for the TAAF, MARION DUFRESNE, who sailed on 7 November 2012 from La Réunion with 97 passengers and 48 crew members on board, arrived during the 13 November night in sight of Île de La Possession, in Crozet Archipelago. 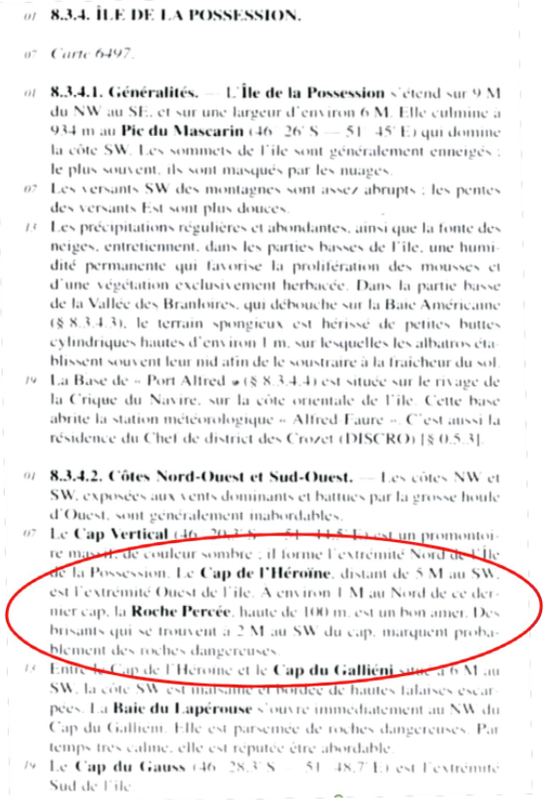 She cast anchor at 0.45 mile in the North of Pointe Basse at 5.50 am. The unloading of the equipment for the scientists’ shelter had been achieved around 8.00 am. The vessel sailed bound to another shelter in front of which she would cast anchor for a similar operation. Baie du Lapérouse, located in the south-west of the Island, is a dozen miles away. The course shaped was rounding the western end of the Island. At 8.44 am, in the west of Pointe des Moines, the master handed over the manoeuvre to the OOW. A few minutes later, when the vessel was closing the waypoint between the 208° and 125° courses plotted on the chart (WP28), the OOW began to alter course. Considering it to be too early, the master took over the manoeuvre back and ordered to set the helm midships then a few moments later, hard-a-starboard. An impact was then felt the vessel took on a starboard list. The speed of the vessel suddenly decreased from 11 to 6 knots. The master reduced speed to slow ahead. He requested to close the watertight doors and to activate immediately the damage control procedures. Soon before 9.00 am, several compartments were reported (remote water level sensors and alarm control panel) flooded by seawater, the vessel was normally floating and making her way slowly ahead. The master decided to proceed to his final destination, the Baie du Marin, located at the eastern end of the Island opposite to Port Alfred, where is the main research station of Crozet archipelago, well protected from the westerly swell. He cast anchor there around 11.00 am. Until 17 November, all the passengers and the half of the crew members had been taken ashore on the Island, in very rough weather conditions due to a succession of strong low pressures. On 23 November, the French cable vessel LÉON THÉVENIN, chartered for assistance, arrived off Baie du Marin and sent divers ashore. On 24 November, they carried on investigations of the hull which led BV to give, on the same day, its agreement for a single voyage. 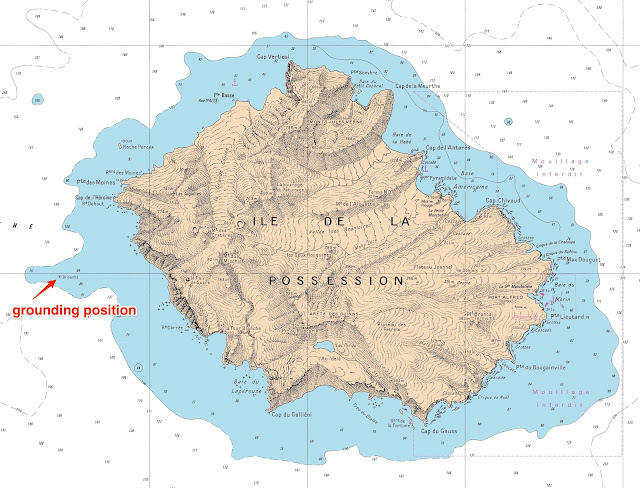 A provisional navigation license had been issued for the voyage to South Africa by the vessel safety centre of La Réunion in the early evening. MARION DUFRESNE sailed immediately, escorted by the tug CORAL SEA FOS sent in the area. On 3 December, around 5.00 am, the vessel arrived on roads at Durban. After some controls (particularly for pollution risks) by the harbour authorities, she was allowed to enter the port where she came alongside in the early afternoon. The technical stop had lasted almost two months. MARION DUFRESNE is owned by GIE MD II (99% TAAF and 1% CMA). The vessel is bare boat chartered by CMA CGM, which ensures the technical management and equipment of the ship. The ship management is entrusted to CMA Ships, a CMA CGM subsidiary. TAAF charters the vessel under a twenty year time charter contract until 2015. The Institut Polaire Français Paul Émile Victor (IPEV) charters the vessel to TAAF 217 days per year for oceanographic surveys in all the oceans, off-ice. All the passengers are managed by the TAAF during logistical voyages towards Austral Islands and aboard under the master’s responsibility. The charterer (TAAF) is represented aboard by the person in charge of Operations and Austral Expeditions (OPAE). He supervises all the persons aboard who are not part of the crew: scientists, persons on mission, in transit, or passengers. After GALLIENI then the first MARION DUFRESNE, her predecessors, the second MARION DUFRESNE, has been designed for the transportation of personnel and equipment to the territories (TAAF public service mission, 120 days per year) and, in addition, to participate in various oceanographic surveys (IPEV). She has been specially built in 1995 to perform this multi-purpose task. Notice particularly, that the subdivision of the double bottoms and the bilge pumping system had been specially designed to ensure the vessel’s buoyancy, taking into account the operation areas, unsurveyed or poorly surveyed, and submitted to inclement weather conditions. Studies are on-going to prepare a major technical stop in order to extend her career for fifteen years. The mission (OP3-2012) in which the vessel was involved at the time of the accident was a TAAF mission, one of the four undertaken each year by the TAAF in Crozet Archipelago, in March, August, November and December. In the TAAF area, the chart coverage and the navigational documents are based on a limited knowledge of the local hydrography. MARION DUFRESNE has been operated intensively in rough sea conditions since her commissioning in 1995 as she has been at sea or mooring more than 93 percent of the time with an average number of passengers of 56 per day. She is assessed by her operators and users as a reliable and safe vessel. She has two work launches (tenders) used for passengers disembarkation or embarkation, but also for towing equipment on « portières » (cf. glossary) and for hydrographic surveys. They have to be operated in sight and in VHF radio range from the vessel, for navigations restricted to sheltered waters. During TAAF support missions, she is fitted with a helicopter. Several scientific laboratories are aboard MARION DUFRESNE, who is fitted with a multibeam sounder and a giant corer (60 m). At 5.12 pm, MARION DUFRESNE sailed from Le Port (La Réunion) bound for Île de La Possession (Crozet Archipelago) with 48 crew members and 97 passengers (TAAF and IPEV members as well as 9 fare-paying passengers). Cloudy / westerly wind force 4 / slight sea state / small swell / good visibility. At 5.00 am, the master came up to the bridge. At 5.50 am, the vessel was at anchor at 0.45 mile in the North of Pointe Basse (Île de La Possession). Equipment for surveys and scientific works had been carried by helicopter to a shelter ashore. At 7.40 am, the « lieutenant Océano » came up to the bridge to take over the watch from the prevention officer who was in charge of the watch from 4.00 am to 8.00 am. She informed him of the situation (vessel still at anchor) and showed him the successive courses to be followed towards the Baie du Lapérouse anchorage at the south-western end of Île de la Possession for a second operation scheduled around noon. At 8.00 am, the « lieutenant Océano » took over the watch, the prevention officer remained on the bridge. At 8.08 am, the operations were achieved and the helicopter was secured in its shed. At 8.16 am, the anchor was aweigh and the vessel got underway under the master’s con towards Baie du Lapérouse. The helm was under manual control. At 8.36 am, the OPEA requested the passengers to leave the left wing of the bridge to facilitate the work of the crew, the passengers complied. At 8.41 am, a new group arrived and settled. The OPEA requested them to move away or to go up to the upper bridge. The master stayed on the bridge, assisted by the OOW, the helmsman was steering. At 8.44 am, the vessel rounded Pointe des Moines at 0.55 mile in the west (radar fix). The master handed over the responsibility of the watch to the OOW who took it up, he drew his attention on the breakers and went on the bridge port wing. The helmsman kept on steering. The vessel was heading 212° at 11 knots. The course laid off was 208°, the radar fix was on the inshore side of the laid off course, the course was altered to come back on the initial track. At 8.52, the OOW made a radar fix and plotted it on the chart. 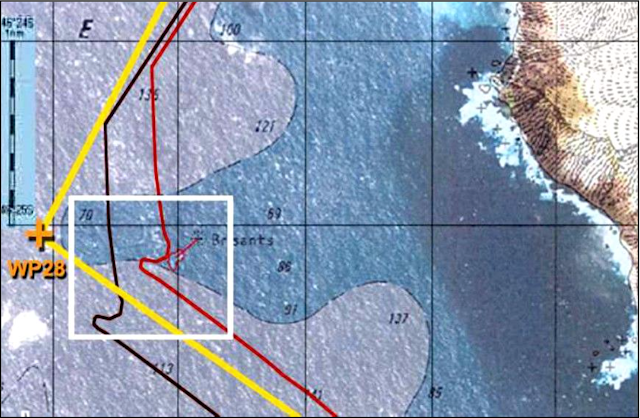 The position plotted showed that the vessel was at 0.2 mile on the inshore side of the laid off track and at 1 mile from the WP n° 28 (in the west of the breakers) marking the next course alteration point. At 8.53 am, the OOW ordered the helmsman: « port ten ». As the vessel was veering quickly on port, the OOW ordered: « Steady as she goes » (i.e. steer on the course of the vessel at the time of the order). The helmsman « met the helm » quickly in order to keep on at the course which was then 180°. At 8.55 am, assessing to have the breakers abeam, the OOW would have ordered (he does not remember to have given this order) to the helmsman to turn to the heading 125°. The helmsman came gently on port. Seeing the vessel veering and understanding that the course alteration was premature, the master came back to the centre of the bridge. He observed that the vessel was frankly on the inshore side of the laid off track. At 8.56 am, the master ordered then the helmsman to set the helm midships, which he did. A few seconds later, he ordered to put the helm hard-a-starboard and at the same moment an important impact was felt on the bow. The vessel heeled violently on starboard. The speed decreased from 11 to 6 knots. The master slowed down to « slow ahead ». At 8.57 am / 8.58 am, as ordered by the master to the OPEA, the passengers left the bridge silently and mustered in the scientific control room. 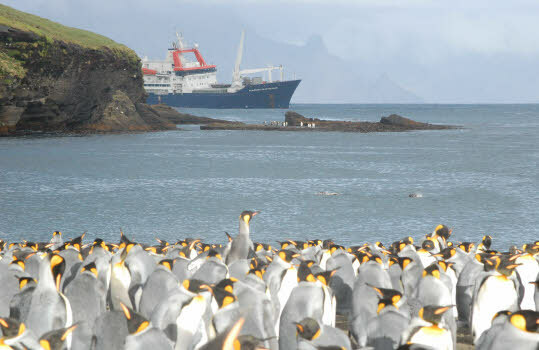 At 8.59 am, the vessel was normally « afloat » and was making her way slowly. capacities in order to identify damages. and to proceed to Baie du Marin, which is located in the south-eastern end of the island, opposite to Port Alfred (Archipelago main base) and relatively sheltered from severe weather coming frequently from the west in this area. From 9.00 am to 10.00 am, the chief engineer, who was on the bridge, ordered to carry on the pumping of the flooded compartments while the crew was investigating. At 9.02 am, the watertight doors were remotely closed. sheltered from the north-westerly wind to cast anchor safely. - 10.14 am / bow thruster room flooded. 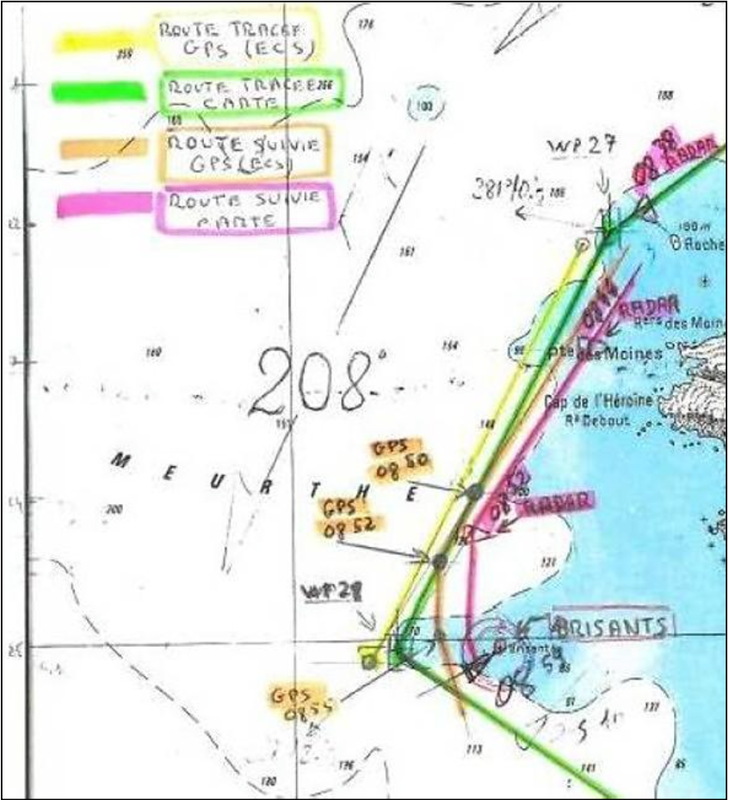 At 10.45 am, the vessel was anchored with 5 shackles in the water, in Baie du Marin, at 0.5 mille in the south of a position defined by the crossing of the alignments. At this time, the assessment of most of the damages was achieved. At 11.33 am, first call to the owner on the emergency line. From 2.40 pm to 2.50 pm, 16 passengers had been landed in 4 helicopter rotations. An ongoing monitoring of the flooded fore compartments had been established through the permanent presence of personnel on a four shift basis, in constant liaison by walkie- talkie with the bridge. During the 14 November, the wind increased to west-south-westerly 8, the master paid out two more shackles, the holding was good. At 7.30 am, north-westerly near gale, a visual draught survey had been done at anchor from the Zodiac: 5.60 m F; 6.70 m A. At the same time probes showed that except for GO4, all the ballast tanks affected by the event were full. At 10.00 am, the bow thruster room was bailed out and made temporarily watertight. At 11.00 am, the water level in the echo – sounder room began to decrease. From 4.00 pm to 4.20 pm, 20 passengers had been landed in 4 helicopter rotations. In the evening winds freshened to Force 8. The weather conditions improved in the early morning. - from 3.20 pm to 5.39 pm, landing of the 61 passengers still aboard. In the evening, north-westerly gale, the anchor was holding good and the drainage of the flooded compartments was carried on (bow thruster room and echo – sounder room). The wind was falling, veering south-south-easterly. A storm was forecast for the next day. From 3.00 pm to 3.35 pm, landing of 20 crew members. Only volunteers (23 persons) stayed on board. The drainage of the flooded compartments was carried on, the breaches were made watertight with cofferdams. West-north-westerly gale becoming quickly a violent storm veering southerly, with 75 knot gusts of wind. The weather conditions fell to west-south-westerly near gale, with 40 knots gusts of wind. The anchor had dragged on a hundred metres (later on, it had been observed that one of the links of the cable had been distorted, it is probable that it happened at this time). The wind fell during the night and veered north-westerly. Island supply operations by helicopter. At 2.24 am, arrival of the cable ship LÉON THÉVENIN. mooring spot to the latter. At 5.44 am, CORAL SEA FOS arrived in the area. From 6.00 am to 7.55 am, the passengers were transferred from the base on Ile de La Possession on board LÉON THÉVENIN with the Zodiac and the launch. From 9.20 am to 1.40 pm, diving operations under the hull in order to assess the damages. The pictures taken had been transmitted to BV which maintained her class. At 8.25 pm, the CSN of La Réunion issued a navigation licence limited to a single voyage to a shipyard for repairs. MARION DUFRESNE began to heave up anchor. 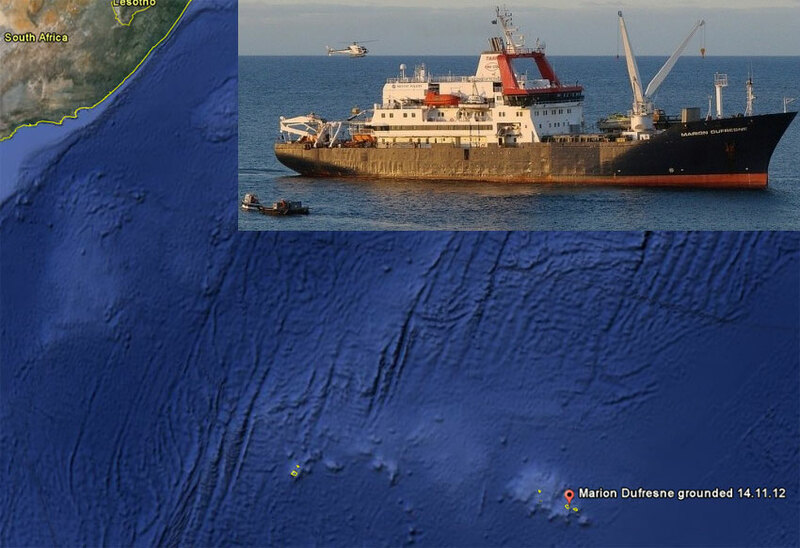 At 8.35 pm, the anchor broke out, the vessel was under way bound to Durban or Mauritius. At 9.00 pm, « Full away » signal. The vessel was escorted by CORAL SEA FOS. As of now, the destination was set as Durban. At the beginning of the week, succession of westerly to north-easterly gales, sea rough to moderate. 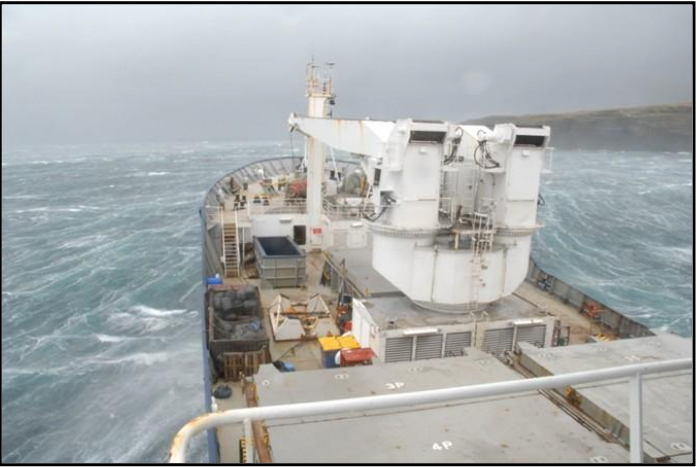 The vessel was labouring due to pitching and rolling which was causing fatigue to the crew. From Wednesday, weather permitting, 160 metric tons of fuel had been transferred in order to empty, as far as possible, the damaged tanks. At 7.30 am, End of « Full away ». From 08h30 am to 10h00 am, inspection on roads of the vessel by the South-Africa authorities. At 10.00 am, underway then waiting. At noon, Authorisation to enter the port of Durban granted. At 1.42 pm, finished with engines, starboard alongside at mole 1 berth 102. At this time, the vessel had been « weighted »: her displacement was 9 100 metric tons instead of 7 800 metric tons corresponding to the displacement observed at the time of the previous dry-docking. The technical stop for the repair of the damaged hull had been 2 months long. The method selected for this analysis is the method usually employed by BEAmer for all its investigations, in compliance with the « Code for the Investigation of Marine Casualties and Accidents » laid out in Resolution MSC 255(84) adopted by the International Maritime Organization (IMO). natural factors ; material factors ; human factor ; other factors. with the aim to reject, after examination, factors with no influence on the course of events and to retain only those that could, with a good probability, have a real influence on the course of facts. The investigators are aware that maybe they have not given an answer to all the issues raised by this accident. Their aim remains to avoid other accident of the same type; they have privileged with no a priori an inductive analysis of the factors which have a significant risk of recurrence due to their inherent character. It had been impossible for technical reasons to extract data from the VDR although the device had been analysed by its manufacturer after the event. The factual elements on which is based the analysis of this event are therefore the master’s sea protest, the documents collected on board the vessel, the pictures of the damages and the testimony of the crew members and of the available passengers. When the vessel touched the bottom, by daylight, the weather and sea conditions were good as well as the visibility (cf. On 14 November 2012, the tidal range was 107, the low-water took place at 7.07 am (UTC + 5) with a 0.05 m height of water and the high water at 1.10 pm with a 0.30 m height of water. The vessel had been able to free herself quickly from the reef. No natural factor had any direct influence on this event. The vessel is fitted with the regulatory navigation equipment. The bridge is fitted with 7 GPS receivers connected to the various navigation or communication devices, 3 of which are directly used for navigation. The reference ellipsoid is always WGS 84. - The navigation GPS Trimble NT 100 and NT 200 are fitted on both sides of the chart table and give the position to the plotter and to the 3 and 10 cm radars. The wheelhouse console located on starboard with the plotter on the left and the ECS on the right. On the « Nautoplot » plotter, the SHOM 6497 paper chart had been set at 5.00 am on 14 November and the changes made to match the plotter and the GPS geodesic coordinate. The proper use of this plotter supposes that the chart has been perfectly positioned and that its positioning is checked on a regular basis. Picture of the Nautoplot plotter taken by a passenger. It is on the top of this chart that are mentioned the changes to the geodesic system, which are used for its positioning. It appears on the picture below that at the time of the grounding, the positioning of the plotter was taking account of the last change done. Corrections « done aboard » written on the paper chart SHOM 6497. The second one corresponds to an observation done by the crew before the exact values had been received from the SHOM. However it had not been taken into account for the use of the ECS. 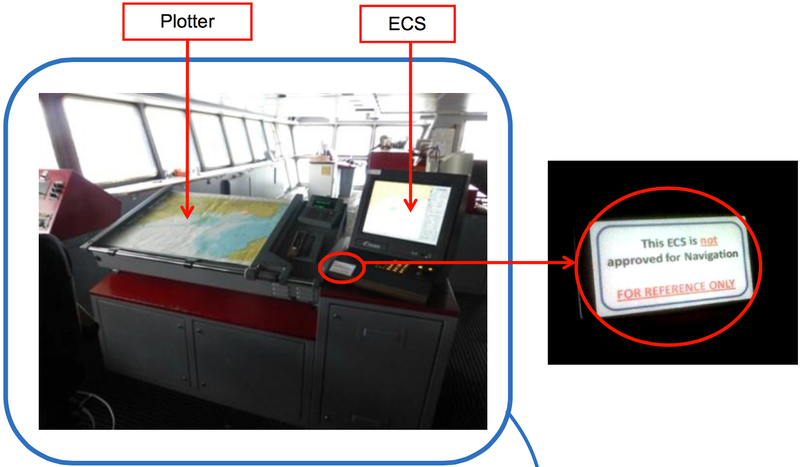 The ECS (TRANSAS navigation system), which display is located on the right of the plotter, is connected to the gyro compass in use, to the Doppler log and to a GPS receiver. On a label placarded on the left hand side of the control keyboard, it is specified that the ECS is not an approved navigation system. This has been reminded by a circular of the company technical service. 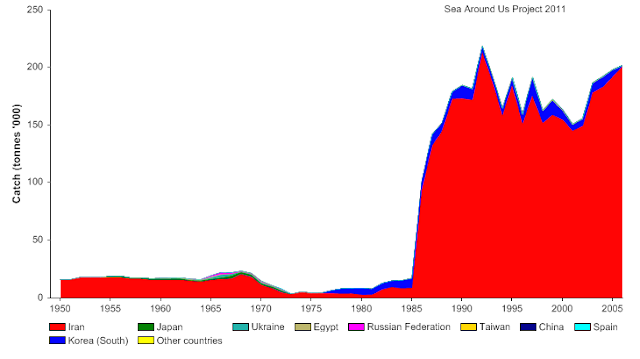 The charts which are in the Transas system memory are mainly Brittish charts. The changes are sent aboard on a CD by Transas via a Belgian provider. The French chart changes (and particullarly chart 6497) are unlikely to be taken quickly into account. on the right an extract of the chart used by the ECS TRANSAS system. On chart SHOM 6497, the 100 m line of soundings which is located in the west of cap de l’Héroïne is a broken line. This means that the position of this isobath is unaccurate. 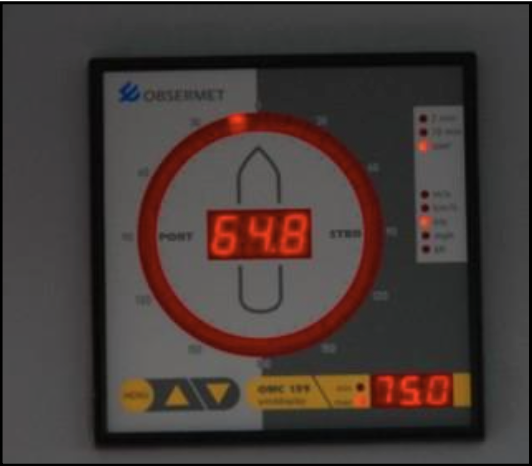 It is observed on the ECS display that, although the reference mentionned is chart SHOM 6497, this 100 m line is a continuous line (see appendix page 48). The chart used by the ECS is therefore slighly different from the reference chart as at least one information is found lost. This unaccuracy is an underlying factor of this event. Curently, for your information, the IHO has defined the ENC (Electronic Navigation Chart), a vector electronic chart produced by an accredited hydrographic service conforming to S57 norm, and the RNC (Raster Nautical Chart) produced by an accredited hydrographic service conforming to the norm - The UKHO producing a range of charts in this format, baptised « ARCS » (Admiralty Raster Chart Service). There is at present no medium or large scale ENC or RNC covering Crozet archipelago. 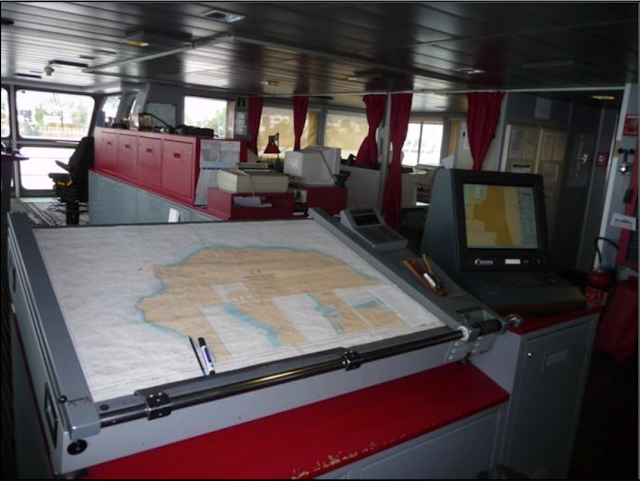 These official charts, used with an ECDIS are the only ones to comply with the requirements of regulation V-19 § 2.4 of the SOLAS Convention about the chart carriage requirements, RNC are permitted exclusively in areas where ENC of an appropriate scale are not available. The other charts, named ECS (Electronic Chart System), are not admitted by the SOLAS Convention. 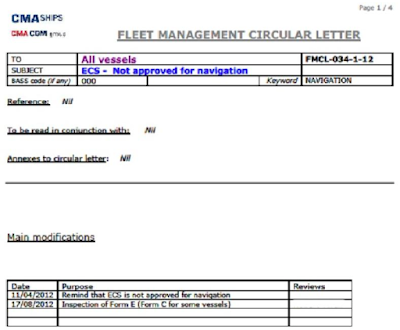 MARION DUFRESNE’s ECS , even fitted with official electronic charts, cannot thus meet the chart carriage requirements as defined in the SOLAS Convention. That was, as it happens, clearly stated on the recommendation displayed on the device. The navigation equipment (radars, sounders, plotter, etc.) worked correctly. On the other hand, the ECS is not approved for navigation (see above). A navigational equipment malfunction cannot be thus retained as a causal factor of this accident. Nevertheless, the significant error (which will be assessed later) observed on the ECS display contributed to the grounding. Taking into account the too much exclusive use of this equipment for the navigation, this error will be studied as a human factor. The chart in use was chart SHOM F 6497 « Archipel des Crozet – Groupe de l’Est ÎLE DE LA POSSESSION – ÎLE DE L’EST ». This chart had been issued complying with the former norms according to geodesic system IGN 62. A magenta printed advice on the top right mentions: « The positions referenced to the WGS geodesic system got from a satellite positioning system (for example from a GPS receiver) must be corrected to agree with this chart. This nota appears on the top left of the chart in the form of an affixed chart appendix. Chart appendix (card, 12-69 SHOM/DOPS/MIP). The chart appendix F 20 corresponding to change 27106 (i.e. change number 106 issued during week 27 - from 1 to 8 July 2012 - ) is as follows : « Satellite positioning: The positions referenced to the WGS 84 geodesic system got from a satellite positioning system must be corrected of 0.03’ southwards and of 0.02’ eastwards to agree with this chart ». Geodesic systems (card, 12-69 SHOM/DOPS/MIP). 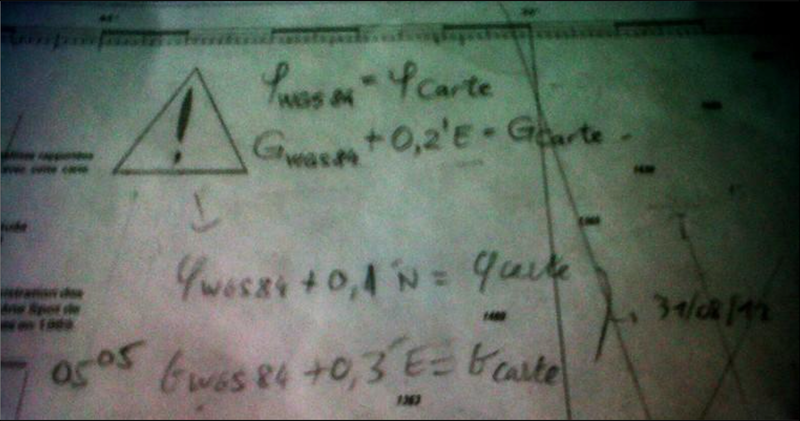 « Satellite positioning: The positions referenced to the WGS 84 geodesic system got from a satellite positioning system must be corrected of 0.08 ’northwards and of 0.37’ eastwards to agree with this chart. These changes (27106 from July 2012 and 37107 from September 2012) do not add up, the second includes the first. At the time of the accident, two changes (see page 23) were affixed on the chart, one (12 27 106) received from SHOM and the other coming from the crew’s observations who doubled the error given by the first. 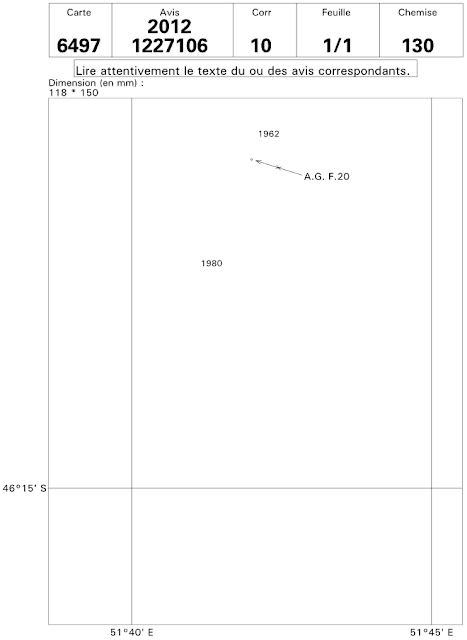 This paper chart was located on the Nautoplot plotter used and positioned in accordance with the last plotted observation. The OOW stated that he did not take it into account, at the moment of the accident as he did not use the plotter, but the ECS. Even though the observation had been plotted on the paper chart (used on the plotter), the change, issued by the SHOM about 2 months before the accident, had not been used for navigation by MARION DUFRESNE’s officers (information not yet received on board). The error between the Radar fix and the GPS position plotted at 8.52 am represents the value of the correction of the chart appendix F 30. 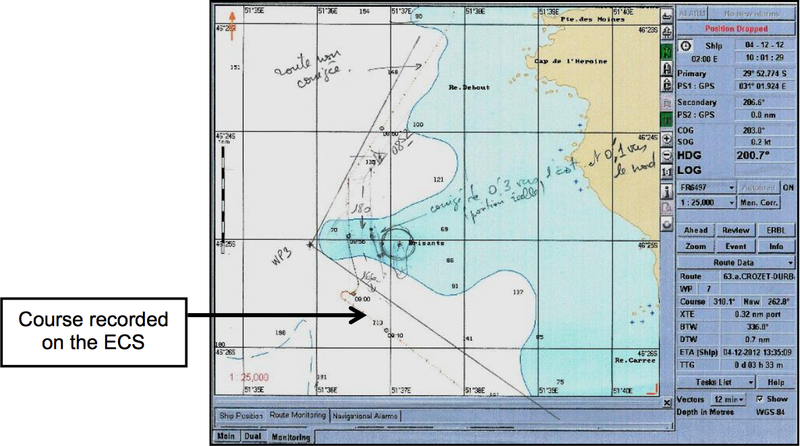 The difference of geodesic reference between chart 6497 and the navigational equipment, which had not been taken into account by the OOW, as he used the ECS and not the up-to-date chart, constitutes an underlying material factor of this event. Sailing directions Volume L9 Edition 2012 - Page 432 INDIAN OCEAN ISLANDS (Southern Part). 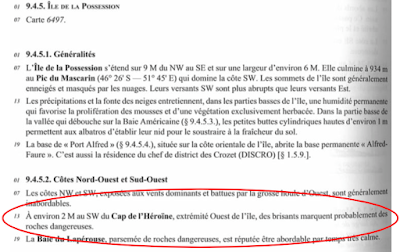 In the sailing directions L9 « INDIAN OCEAN ISLANDS (Southern part) », one can read in the 2001 edition in the chapter dedicated to Ile de la Possession in Crozet archipelago page 329 § 8.3.4.2 (North-West and South-West coasts / 07) : «Cap de l’Héroïne, (...) Breakers located at 2 M in the SW of the cape, probably indicate hazardous rocks. This sentence has not been modified by a notice to mariners. In the 2012 edition of these sailing directions, published at the end of September 2012, which had not yet been received aboard, the following information is written in the chapter dedicated to the same island, at page 432 § 9.5.4.2 (North-West and South-West coasts / 013): « At about 2 M in the SW of Cap de l’Héroïne, western end of the island, breakers probably indicate hazardous rocks. Sailing directions Volume L9 Edition 2001 - Page 329 INDIAN OCEAN ISLANDS (Southern Part). 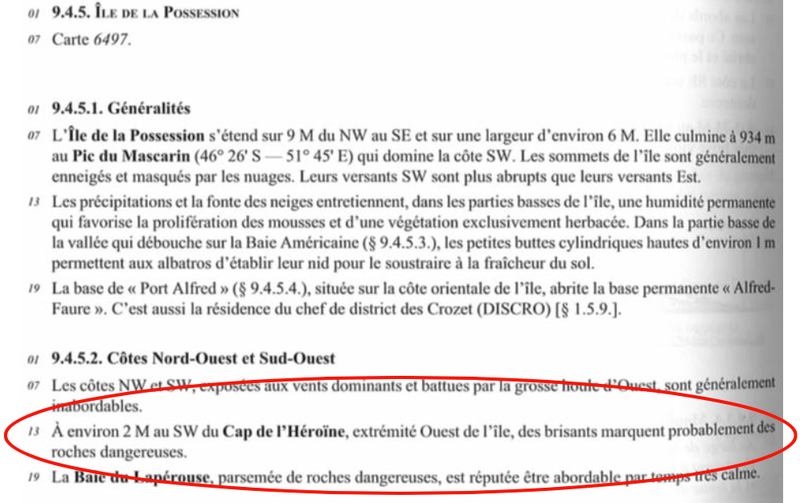 One notices notably that the word « about » has been added concerning the position of the breakers relatively to Cap de l’Héroïne, which takes into account the changes transmitted by the Notice to Mariners number X 12 27 106 and X 12 37 107 reminded in the previous subparagraph concerning the geodesic system. The reading of this extract from the sailing directions stresses, if proofs were needed, the need that the track laid takes into account the inaccuracy of the position of hazardous rocks and for the OOW to follow the laid track. The « Brisants » (breakers) which appear on chart 6497 and which are mentioned by the sailing directions L9 were not visible on the day of the grounding due to fair wind and sea conditions. Years ago, they had been reported to the SHOM by the first MARION DUFRESNE who, after GALLIENI was then the main source of nautical information in the TAAF and was thus upstream from SHOM. Nowadays, the amount of information provided to SHOM by MARION DUFRESNE is significantly less. The few items collected by the SHOM come, actually, from vessels of the TAAF and those of Marine nationale. 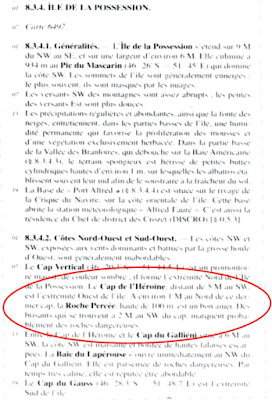 For your information, the instruction from the prime minister about the collection and the broadcast of the nautical information n°228/SGMer issued on 03 May 2002 designates the captains of military vessels and the masters of the vessels among the authorities responsible for the search, the collection and the transmission of information which could alter nautical publications. Following this maritime casualty, the SHOM, concerned by the safety of navigation in the areas where the bottom is not fully charted, has ordered satellite pictures of this coast of Île de La Possession. The processing of these pictures had been complex, because the area is frequently cloudy and the submerged rocks are difficult to identify. 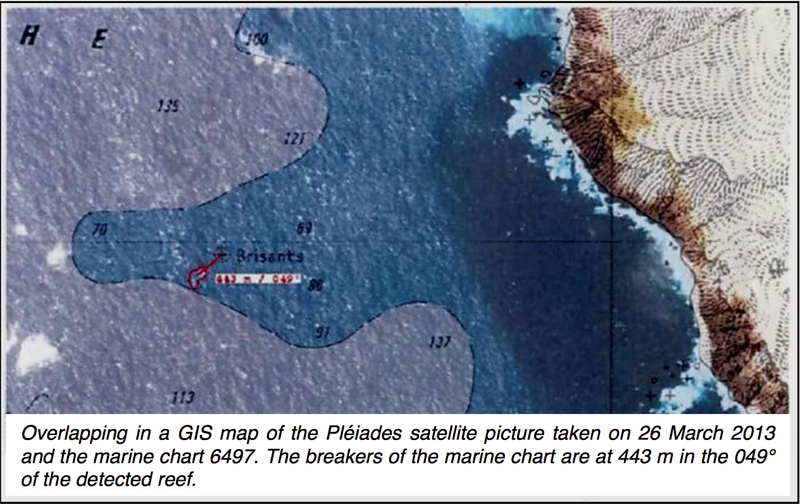 The picture above, got on 26 March 2013, overlapped with the marine chart 6497, proves that the breakers are located on the marine chart at 443 m in the 049° of the detected reef (this picture had been provided to BEAmer by the SHOM). In the SW of Cap de l'Héroïne. (SHOM, FE N°24 DOPS/MIP/GEO/NP issued on 11/04/2013). MARION DUFRESNE could not, in November 2012, be informed of the true position of these breakers. They have been re located in the vicinity of the broken 100 metres line of soundings, just on its inshore side. The inaccurate position of the breakers on chart 6497, and though on the ECS display, constitutes also an underlying material factor. 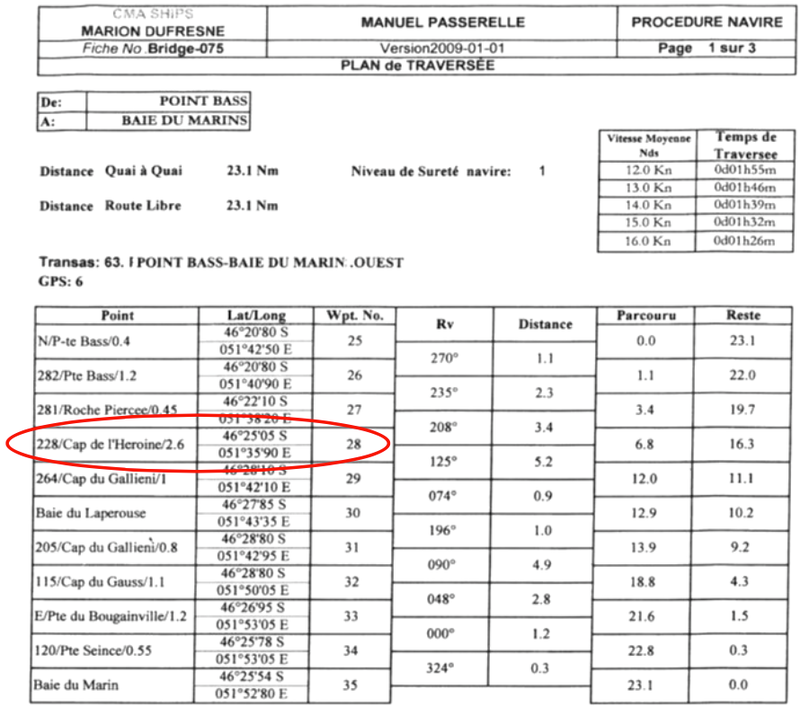 The passage plan had been established in January 2009 and had been the reference to lay the courses for this voyage. This laid off track left little room for error given the uncertainties raised by the sailing directions (cf. appendix C) in this unsurveyed and unmarked area. Given the error observed by the SHOM between the horizontal datums which has been published by a notice to mariners, the track laid off according to the passage plan established in January 2009, had a reduced margin of safety at this place. The laid off track constitutes thus an underlying factor. Courses were laid off by the navigation officer under the control of the master to round the island to the west, at the edge of the 100 metres line of soundings. The major identified and borne hazards were the breakers of Pointe Basse located at 0.4 mile of the anchoring point, the Île de La Roche Percée which was rounded at 0.4 mile and the breakers located in the south-west of Cap de l’Héroïne that the course laid off rounded at 0.8 mile to the west. The ECS is based on chart SHOM F 6947 and on the display, the vessel was, soon after 8.55 am, close to WP 28, in the vicinity of the label « Brisants » (breakers). This picture is the result of the overlapping of chart 6497 processed by the SHOM, data from satellite imagery which shows the real position of the shoal and the chart used by the ECS. the red track represents the actual course on the ground reconstructed by BEAmer given the real position of the collided reef, the grounding sequence of events and the damages observed on the hull of the vessel (port bow). 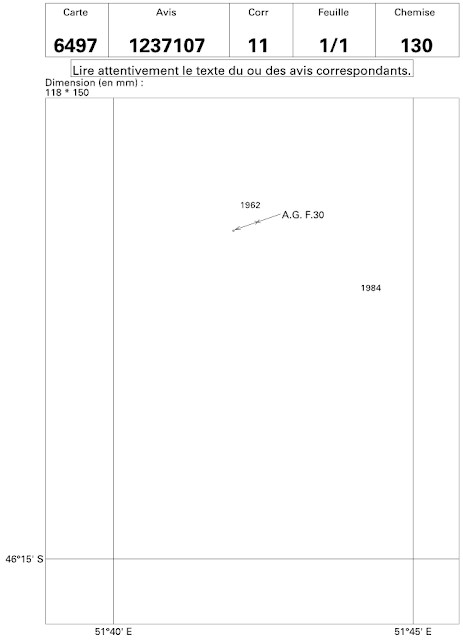 The white frame is zoomed on next page. The OOW followed the black track while he was actually on the red one. He was therefore at 0.38 mile in the 049° of the position he thought to be his (i.e. 0.24 mile more north and 0.43 mile more east). - The first, « 0.03’ of latitude towards the south and 0.02’ of longitude towards the east ». - The second, « 0.08’ of latitude towards the north and 0.37’ of longitude towards the east » which cancels and replaces the first. They were available before the accident on the website of the SHOM. 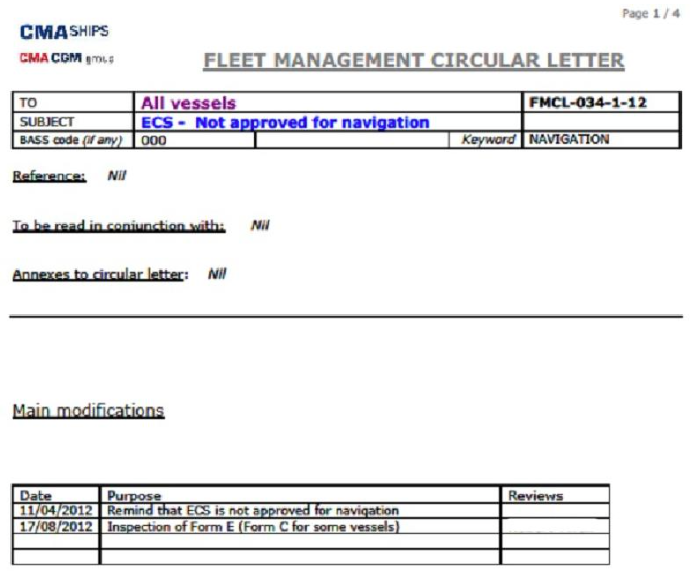 These correction items were not taken into account for the navigation with the ECS (non approved equipment for navigation). On the chart above, the changes are indicated by the points A1 and A2. The impact of the vessel’s hull on the north-western part of the reef (real position SHOM) leads to a difference with the position indicated by the ECS of « 0.17’ of latitude towards the north and 0.02’ of longitude towards the east ». This error is thus attributable to the ECS. On the chart below, the grounding position is indicated by point A3. 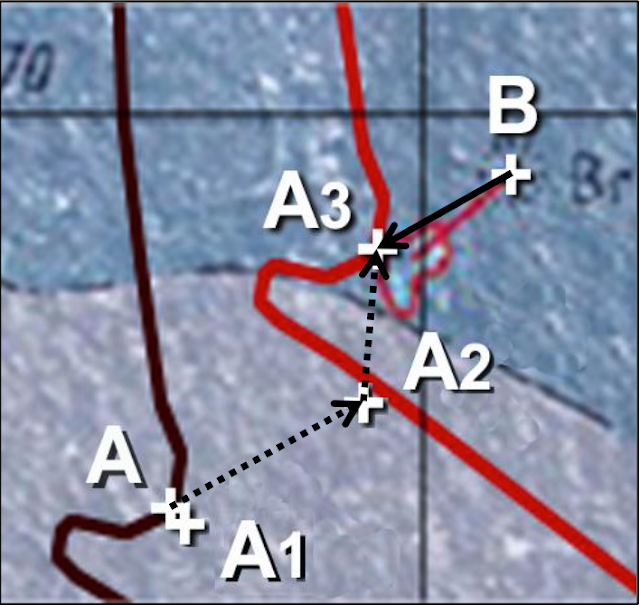 The error between point B (« Brisants » (breakers) indicated on chart 6497 before change 13.19.158) and point A3 is the result of the repositioning of the reef done by the SHOM which put the hazard closer to the 100m line of soundings. This information, later than the accident, was not available at the time of the event. The failure to take into account the difference of horizontal datum for the navigation with the ECS at this position, the poor management of the inaccuracy of the positioning of the breakers and the use of the ECS as the unique navigation aid are elements the addition of which is a causal factor of the grounding. It has not been possible for BEAmer to analyse to what extend the depth indications got from the echo sounder had been used for navigation before touching the ground. It is certain that because of the vicinity of broken isobaths, the use of the echo sounder would have given an alert for the vicinity of the shoal. From the previous way point, WP27, taken on the inshore side of the laid off track, the vessel had always been sailing on the inshore side of this track, at about 0.4 mile. At 8.44 am, the OOW had taken over the effective responsibility of the watch a few minutes before the accident, but he had been on the bridge for more than one hour and he laid off himself the radar fixes on the chart since getting underway. When the master handed over the con to the OOW, he reminded him the presence, on the chart, of breakers to round (this had been confirmed by both of them). Therefore he had these well in mind and he knew that he should alter course to 125° in the west of these breakers in order to head to Baie du Lapérouse anchorage. The cross track error was then similar to the error between the equipment horizontal datum WGS 84 and the chart horizontal datum IGN 62, i.e. almost 0.4 mile. Although GPS fixes positioned MARION DUFRESNE on the inshore side of the laid off track, the OOW anticipated the course altering by cutting the corner between the current heading 213° and the next 125°. It appears that at this time, the OOW was confident in the position displayed on the ECS to the detriment of the positions that he laid off himself on the chart from radar bearings and distances. This ECS picture had been recorded at 8.52 am, a moment before the vessel altered course to 180°. The heading was then 213°. The reference displayed on the device is chart 6497, but the line of soundings appears as a continuous line. The anticipated course alterations compared to the laid off course, approximately sailed along, constitute an aggravating factor of the previously identified factors. However, the fact that the master stopped the turning, when he realized what manoeuvre was on going, saved the vessel. while the vessel was approaching Durban for repairs. The company uses mainly the « Admiralty charts and publications » whose updating is transmitted by its provider through the Internet. 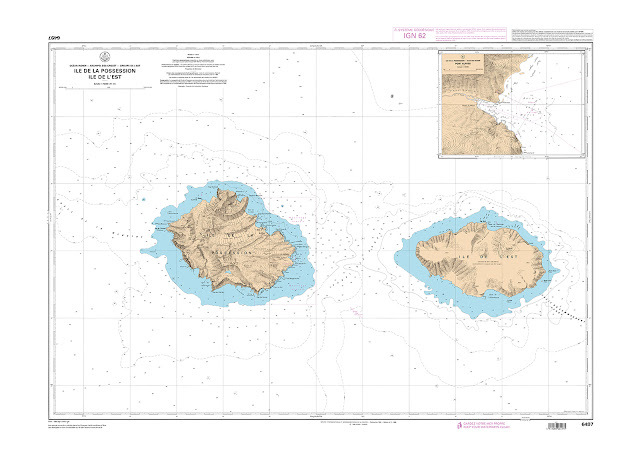 The chart of Crozet archipelago is not part of the « Admiralty portfolio ». The only existing chart is the SHOM chart whose horizontal datum is not the WGS 84. The changes to the SHOM charts are downloaded by the competent department (NAVCOM) of the company on the SHOM website and transmitted to the vessel on a compact disc. The SHOM last change (n° 12 37 107 broadcast and available on the Internet on 15 September 2012), concerning the latitude and longitude errors related to GPS coordinates (which happened to be close to the indications laid off on the chart on 31 August 2012 (0.1’ N and 0.3’ W)), had not been downloaded by the vessel at the time of the grounding. This constitutes an underlying factor. In this respect, it should be noted that the vessel does not have any Internet access for her administration and nautical management, and that the chart appendix F30 had not been included in the corresponding sending by the « Navcom » department of the company. - a new process of assessment of all the sailors joining the vessel and at the time of recruitment. An improvement of simulator training. aboard MARION DUFRESNE (sailors or not). - A crisis management plan in the Terres Australes. The ship-owner has reminded, in the master’s permanent orders, the latitude given to the OOW, to request people not involved in navigation to leave the bridge whenever it is necessary. According to circular MSC 1/1222, the VDR is subjected to an annual visit (the last one took place on 18 May 2012 and the test proved conclusive). On 14 November 2012, nearly one hour after getting underway from the anchorage at Pointe Basse in the north-west of Île de la Possession, bound to the next anchorage, at about two hours sailing, the master handed over the watch to the OOW. Assessing that his position allowed it, the OOW altered course, cutting the corner, from heading 208° to heading 125°. - The too exclusive use of the ECS. The last minute manoeuvre initiated by the master did not prevent from touching the ground but saved the vessel. After the emergency measures and the damage assessment achieved, the vessel sailed to Durban for repairs, after the passengers had been landed. This event could have had worst consequences if the crisis management on board and ashore had not been perfectly controlled, especially as, in this remote area, the weather conditions are often severe. 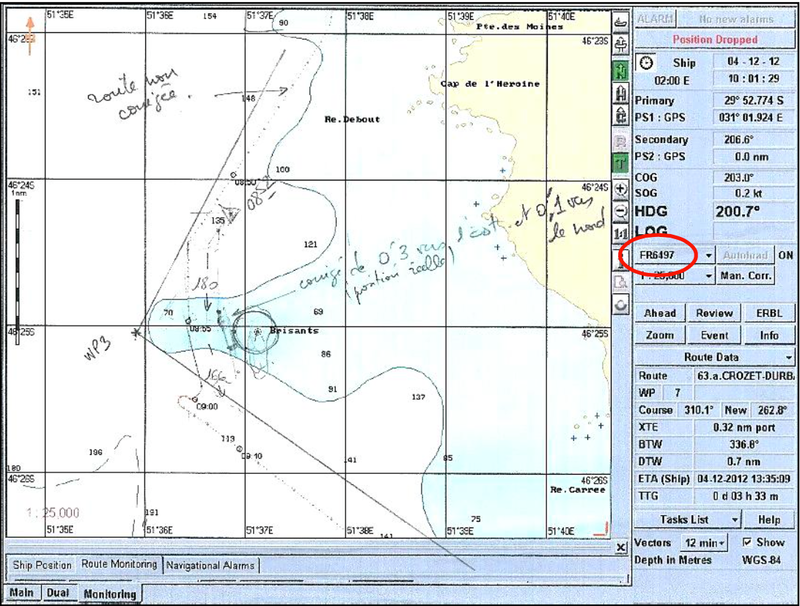 1- 2013-R-053: navigation equipment not approved by the IMO should be used with prudence, and the positions have to be systematically cross-checked by other approved systems (radar), particularly in confined waters or close to the shore. 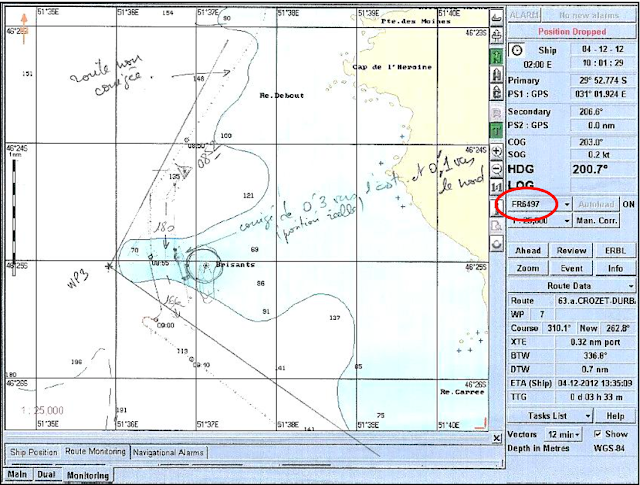 2- 2013-R-054: to warn, even more, cadets of the risks inherent to the use of navigational electronic aids (particularly the GPS) without cross-checking with visual and radar observations. 3- 2013-R-055: to make sure that the charts, particularly electronic charts and the sailing directions are kept up-to-date, underlining that the use of such a documentation should be done with the concern to select the best available source in the geographical area of operation. 4- 2013-R-056: to republish the chart SHOM 6497 with the horizontal datum WGS84. 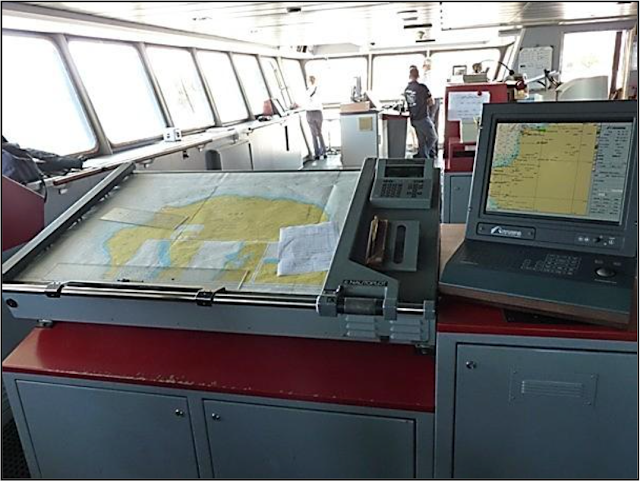 5- 2013-R-057: to develop written procedures in order to preserve, on the bridge, the quality of the lookout and the necessary concentration for the practice of navigation, particularly during manoeuvres and in hazardous navigation areas. 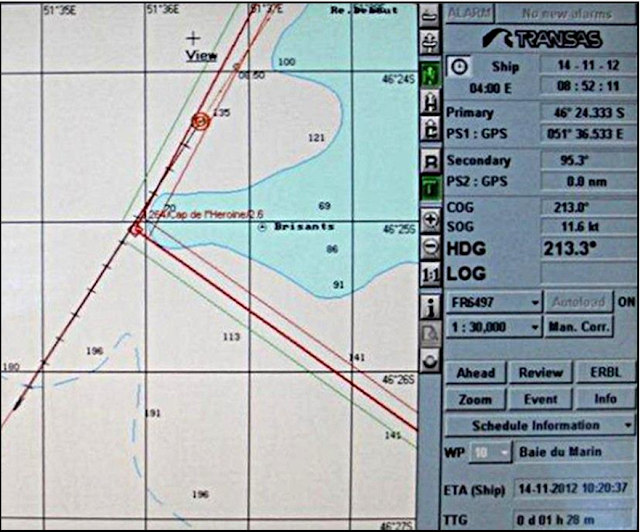 6- 2013-R-058: to coordinate the requirements for nautical information and for buoying in the TAAF in cooperation with the maritime players interested in navigation in these areas. Sponsored by the Sunday Times of London, the much-ballyhooed event attracted a field of nine, including amateur sailor Donald Crowhurst, who set out to circumnavigate the globe in late 1968. Battling treacherous seas and his own demons, Crowhurst almost immediately comes apart as he faces the isolation of nine months on the high seas. Part adventure yarn and part metaphysical mystery, DEEP WATER is an unforgettable journey into one man's heart of darkness. Absolutely stunning story about a man, honor, dignity, family and loneliness. After 240 days at sea, Donald Crowhurst was sailing home in triumph - a novice who'd beaten the world's best in the sport's most gruelling race. But then his empty boat was found adrift in the Atlantic. Forty years after the compelling and tragic mystery, Robert McCrum meets the family of the infamous 'lone sailor'. I have always been convinced that Donald didn't commit suicide," says the bright-eyed 77-year-old grandmother, sitting by her fireside in Seaton, a south Devon coastal town. "It's such an awful story and I suppose we will never know what happened at the end." Outside, it's thriller weather: grey skies, an icy swell breaking on the deserted front, and the plaintive commentary of a few stray seagulls. Clare Crowhurst recollects the terrible past calmly enough today, but 40 years ago she was known to news-paper readers as the "sea widow". Follow the progress of the Golden Globe Race from March, 1968 to July, 1969, tracking Donald Crowhurst's journey and those of his competitors. See who finished, who won and who paid the ultimate price. Positions on the map are estimated. Back in 1969, her husband, Donald Crowhurst, was the protagonist of the strangest, most disturbing story of its time, part adventure, part mystery, but mostly tragedy. He was the yachtsman who fooled a credulous press and public into believing that, after a voyage of 240 days, he was sailing home to England in triumph, apparently the winner of the Sunday Times's Golden Globe Race, the fastest nonstop single-handed round-the-world race. Thousands prepared for his happy return. When his trimaran was found, ghosting through the mid-Atlantic under a single sail, there were clues to its last voyage in three log books, but its lone captain was missing, and when the truth came out his fate was swamped by the larger story of his hoax. "I used to dream about it for years," says Clare. "In fact, during June 1969, I imagined I heard the front door open and Donald calling out 'Clare', as he always did." Her second son, Simon, a young middle-aged man with a premature shock of white hair and the bright, questioning eyes of a lost boy, is also haunted by his father's fate. He holds a chunky wooden model of the boat, and talks about the curse of the past. "I feel compelled to think about my father's story," he says. "He's the Ancient Mariner, of course, but I feel like the narrator." Simon sees it as an existential cliffhanger. "My father becomes this solitary hero in the limelight of history," he says. "When you're alone, just you and the ocean, it's the whole of your universe... It's no longer about heroes and adventures at sea. It's about isolation and the delicate mechanism of the mind." Poignant, ominous and unforgettable, the story has inspired many elegiac narratives: by the American poet Donald Finkel, the playwright Chris Van Strander, and an opera, Ravenshead. Responding to its archetypal depths, director Nic Roeg developed a film script in the 70s, though it was never made. In 1982, the French based Les Quarantièmes Rugissants (The Roaring Forties) on the Crowhurst story. In 1992, the American novelist Robert Stone based Outerbridge Reach on the strange events of that long-ago summer. The story starts in 1968, the climactic year of the 60s: to the soundtrack of Sergeant Pepper and the Doors, tides of workers and students demonstrated against the Vietnam War; just a few weeks apart, Martin Luther King and Bobby Kennedy were assassinated; Soviet tanks rolled into Prague; and, out in space, Apollo moonshots were pitching man against the universe. Here in Britain, the mood was nostalgic and quasi-Elizabethan. Seafaring adventure was in the air. The year before, Francis Chichester had sailed his Gipsy Moth into Plymouth to a tumultuous welcome, a media frenzy, and a knighthood from the Queen, conferred on the quayside, as if she were Gloriana herself. The Americans might hurtle upwards in their rockets, but here on earth plucky Brits still ruled the waves. The press, scenting a new audience for drama on the high seas, splashed yachting stories across its front pages. Chichester's account of his voyage, The Lonely Sea and the Sky, became an instant bestseller. During the spring of 1968, in direct competition with the Observer's Transatlantic Race, the Sunday Times launched a nonstop challenge, the Golden Globe round-the-world yacht race. Finish of the 1968 Sunday Times Golden Globe Single-handed Race around the world. Sir Robin Knox-Johnston was the only one to finish of 9 starters and completed the voyage in 312 days. He was in his 32 foot ketch Suhali. "Nonstop" was to be the supreme test. Chichester had broken his journey in Australia. It was widely held that neither a solo yachtsman - nor his boat - could endure the stresses and strains of single-handed sailing for months on end. However, swept up in the mood of the moment, nine sailors stepped forward to compete for two prizes. Setting off any time before 31 October, the first man home would take the honours, a Golden Globe, while the fastest circumnavigation would scoop a tempting £5,000. The competitors came from the cream of international yachting. There were high-profile challengers, the transatlantic oarsmen Chay Blyth and John Ridgway, in rival monohulls. There were two veteran French sailors, Bernard Moitessier and Loïck Fougeron, an ex-merchant seaman, Robin Knox-Johnston, the Italian Alex Carozzo, two former naval officers, Bill King and Nigel Tetley. Finally, a very late entry, almost as an afterthought, there was the "mystery man", an obscure West Country electronics engineer named Donald Crowhurst. Compared with the field, Crowhurst was hopelessly inexperienced, at best a Boy's Own hero, at worst a fantasist. Occasionally described as a "businessman", Crowhurst was British, but really an orphan of empire, born in the India of the British Raj in 1932, where his father worked as a superintendent on the railways. After Independence in 1947, the family had returned with their meagre savings to England, but discovered that life in the suburbs of Reading was not an idyllic homecoming. The climate was brutal; money was tight; almost at once Crowhurst senior dropped dead from a heart attack. Like a character from Dickens, young Donald was forced to leave school early and train as an apprentice at the Royal Aircraft Establishment (RAE) in Farnborough. Restless, broke and ambitious, a fish out of water, Crowhurst drifted from a commission with the RAF into the army, but was forced to resign after a rowdy evening involving a stolen car brought him before Reading magistrates. Eventually, he married Clare O'Leary, an Anglo-Irish protestant girl from Killarney, moved to the West Country, and started a small computer business, Electron Utilisation Ltd.
An obsessive tinkerer, Crowhurst had invented the Navicator (a radio direction-finding gizmo that is now commonplace in any weekend sailor's arsenal), which he believed would make his fortune. Crowhurst was scarcely more than an enthusiastic amateur sailor, but when the Sunday Times's Golden Globe Race was announced, its £5,000 prize money (the equivalent of £65,000 today) seemed a heaven-sent way to stave off impending bankruptcy, until sales of the Navicator took off. Impetuous, charming and headstrong, a self-confessed "romantic" in search of fame and glory, Crowhurst persuaded a local caravan dealer and millionaire, Stanley Best, to sponsor his entry, and commissioned a Norfolk boatyard to build a trimaran. From the moment of Best's involvement, the Crowhurst story takes on a darker hue. He hired a publicist, Rodney Hallworth, a provincial hack and former crime reporter for the Daily Mail and Daily Express, who fed Crowhurst's fantasy life and persuaded him to headquarter his race campaign in Teignmouth. Crowhurst mortgaged his house and his business against the sponsorship. He was Icarus, with an overdraft. It was a desperate gamble. Competitors had to set sail before 31 October and some had already left. The "mystery man" was coming into the race with an untried boat, seriously unready and ill-equipped. "I don't think," says Simon Crowhurst carefully, "that my father realised how badly things could go wrong." On its first sea trial, from East Anglia to the West Country, Crowhurst's yacht, the Teignmouth Electron, underperformed so badly in the Channel that a three-day trip took two weeks. Now there was no time to equip and provision the vessel properly for the race. Up against the departure deadline, Crowhurst was faced with a stark choice: set sail with a dodgy boat or withdraw from the race and face humiliation and bankruptcy. So, in the afternoon of 31 October 1968 - the last possible moment - after an embarrassing false start, Crowhurst set out from Teignmouth. "Look after your mother," he whispered to his son, a strangely prophetic command. Simon remembers the departure well. "We were watching from the shore. I don't think any of us quite knew what was going to happen next." It was the beginning of Crowhurst's career as the Ancient Mariner. Few could have anticipated how cursed, and literally fabulous, his voyage would become. To sail round the world in the 60s was to embark on a voyage of the ages. There was no GPS, satellite communication, or internet: just a fuzzy radio link, and perhaps a morse code transmitter. The lone sailor was a speck on the ocean, relying on sextant calculations. Simon Crowhurst believes that this is part of the lasting appeal of his father's story: one man against the elements, a man on the edge of oblivion, risking all. "It's a story that people remember, and that's a consolation," he says. "It's a story that tells you something about what it means to be human." As the Teignmouth Electron slipped down the Channel on the long leg to the Cape of Good Hope, the first act of the Crowhurst drama was concluded. All the elements of tragedy were in place: a curious public; a hungry media machine; and a weekend sailor heading into dangerous water. Worse, and grimmer still, it was only once he was properly at sea that Crowhurst's secret fears were realised. His boat, so hastily assembled, was a dud. Ever optimistic, before departure he had calculated that, however late he set off, the superior speed of his trimaran would enable him to overhaul the other competitors and record the fastest circumnavigation. He had never done much more than cruise up and down the south coast in a small sloop at weekends, but with impressive self-belief he had estimated that the Teignmouth Electron could be made to sail some 220 miles per day. After a fortnight at sea, Crowhurst had not averaged more than 130 miles a day, and had barely passed Cape Finisterre and the coast of Portugal. More alarming than his boat's underperformance, it had sprung a leak. He wrote in his log, "This bloody boat is just falling to pieces!!!" As well as the terror of the seas, waves as high as a 12-storey building, merciless winds and the terrible apprehensions induced by solitude, Crowhurst was now battling a more insidious, mental terror: the fear of not winning the all-important £5,000. Crowhurst's solution to his predicament was a version of the truth that he, alone, could verify. On 10 December, after about six weeks at sea, he cabled Rodney Hallworth with the astounding news that he had just sailed, in one day, a record 243 miles. To himself, he described his false record as "a game". As the remorseless logic of the hoax corrupted his relationship with reality, this game became a matter of life and death. Now the media side of this strange tale kicks in. Hallworth had only one concern: to hype his client's story. In these early days of modern media relations, flogging the hell out of a scrap of news, unsourced, unverified and over-exaggerated, was all in a day's work for the publicist. All at once the "mystery yachtsman" became the record-breaking "lone sailor". Francis Chichester was privately sceptical and referred to Crowhurst as "the joker". He could never have anticipated how audacious the joker's prank would become. The race was still front-page news. As Crowhurst struggled to get the Teignmouth Electron to make headway, the Sunday Times ran a story, "The Week it all Happened", describing how Carozzo, Fougeron and King had been forced to retire from the race from which Blyth and Ridgway had already withdrawn, while Robin Knox-Johnston battled mountainous seas off New Zealand after a horrendous capsize. There was nothing to report about Crowhurst, trailing at the back of the pack, but this did not stop his press agent parcelling out his client's progress with teasing hints of more record-breaking feats. Hallworth's public faith in the yachtsman he called "my boy" was part of his charm as a PR man. On Fleet Street, indeed, only the Observer yachting correspondent, Frank Page, evinced any disbelief about the progress of the Teignmouth Electron, sceptically describing "a typically forthright claim from Donald Crowhurst, currently lying a poor fourth in the race". The truth of his situation was infinitely worse. Even with the trade winds of the mid-Atlantic, he was making painfully slow progress south and had barely crossed the equator. Deep Water Trailer or the 2006 feature documentary from Met Film Production. "To watch this documentary is to invest exhaustively in its compelling cast of characters. The log books tell the true story. In parallel with the fake co-ordinates of Crowhurst's record-breaking voyage, pages of meticulous fabrication, is the record of a man dawdling about the South Atlantic in a leaky boat, slowly going out of his mind. While her skipper was claiming to be "somewhere off Cape Town", the Teignmouth Electron was actually sailing past Brazil weeks behind the race leaders, a deception that would be impossible today. Crowhurst spoke to his wife, but he was vague about his location and did not confess the truth of his predicament. Soon after this, blaming a broken generator, he shut down all ship-to-shore communications. Simon Crowhurst remembers that he and his brothers used to trace their father's progress by sticking pins into a map of the world. Slowly, through January, February and March 1969, this comforting ritual faltered, and stopped. Things were bad at home. Clare Crowhurst was now drawing the dole. Her youngest son, Roger, was suffering nightmares in which his father stood staring at him from the doorway of his bedroom. Simon says that, "The sense that something was badly wrong began to grow at the back of our minds." Out on the ocean, a terrible race continued to take its toll. Bernard Moitessier, having sailed past Cape Horn, decided that he preferred the solitude of his boat to the strain of la vie normale. The Frenchman cabled his wife an enigmatic au revoir and changed his course to begin a second circumnavigation. He would finally make landfall in Tahiti. Now in a field of three, Crowhurst was still lying last. Then he came up with the narrative twist that changed everything. 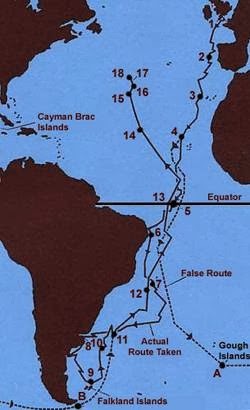 On 10 April 1969, Crowhurst broke radio silence with a typically ebullient message, claiming to be heading back up the Atlantic, having cleared Cape Horn. "What's new ocean-bashingwise?" he asked. "It was as if," in Simon's words, "he had come back from the dead." Hallworth hammered out an excited press release. Across Fleet Street, a frisson of spring fever sent the Teignmouth Electron "rounding the Horn" and Crowhurst into serious contention for the £5,000 prize. Ahead of him in the race were just two boats, Robin Knox-Johnston's battered ketch, Suhaili, and Nigel Tetley's trimaran. Knox-Johnston was almost home, but Tetley looked most likely to be the winner of the prize for the fastest circumnavigation. With a message that now seems richly ironic, Hallworth cabled Crowhurst: YOURE ONLY TWO WEEKS BEHIND TETLEY PHOTO FINISH WILL MAKE GREAT NEWS STOP. The stage was set for the denouement of this "seafaring classic". Crowhurst's plan relied on Tetley's two-week lead. His deception - the circumnavigation that never was, the fake log books, the whole hoax of his nonexistent voyage - depended on not winning. It was essential, having survived undiscovered, that he should come in last. This was the kind of hogwash in which Rodney Hallworth specialised. If Crowhurst sailed into Teignmouth, behind Robin Knox-Johnston and Nigel Tetley, as seemed inevitable, no one would give his phoney log books a second glance. He could slip ashore and resume civilian life as that quintessential British hero, the nearly man. He reckoned without Tetley's British naval bloodymindedness, a determination to win that would shortly prove disastrous. To keep ahead of the Teignmouth Electron, now reportedly coming up fast behind him, the ex-naval commander piled on the canvas, ploughing through a gale in the mid-Atlantic to maintain his position as race leader. Departed Teignmouth at 16:32 hours. Off Portugal having logged 1,300 miles, was only 800 miles along his intended route, a distance he intended to cover in six days. He was beginning to realize that there was no way in which he could win the race with such slow progress. Trouble with generator. Off the Canary Islands, was possibly now having thoughts about falsifying the voyage. Off Cape Verde Islands. The start of the false route. He would now use two Log Books, one with actual route for navigation and one with the false route. Off Brazil. Damage found to the starboard hull. His claimed position off Gough Island at the commencement of his radio silence, said to be due to generator problems, heading apparently for the Southern Ocean. Landed at Rio Salado, in Argentina for repairs to starboard hull. This would have disqualified him if it had been known by the race organisers. Departed Rio Salado 8th March. Off the Falkland Islands after slowly meandering around the South Atlantic to waste time while his false route apparently rounded Cape Horn. Having slowly sailed north he breaks radio silence to send false signals about his position. His false route through the Southern Ocean to Australia, New Zealand and Cape Horn would have taken him to this position on this date. He picks up his actual route, restarts serious racing and ceases the deception. Position on the day that the race leader's boat sank; Cmdr Nigel Tetley in Victress. This now put Crowhurst apparently in the lead. Crowhurst now caught in a tangled web of deceit over his false voyage and begins to doubt whether he can contain the guilt when he returns to Teignmouth as the apparent winner. He crosses the Equator sailing north. Increasing despair over his situation. Log books filled with strange entries. His mind appears to he breaking down. Last entry in navigation log. Other Log books now contain more strange entries - poems, quotations, etc. Teignmouth Electron sighted by SS Cuyahogg. 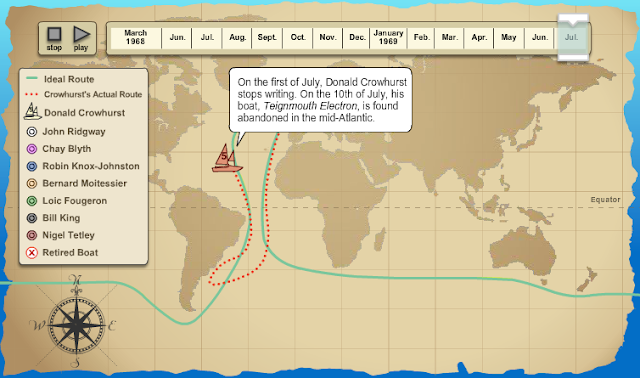 Presumed point when Crowhurst went overboard. Teignmouth Electron found abandoned by the RMS Picardy, taken aboard and shipped to the West Indies where she is still to be seen on the small island of Cayman Brac. Of the four Log books carried, one was found to be missing. In the storm, Tetley sustained more damage. Finally, off the Azores, just 1,000 miles from home, his trimaran began to sink. Air-sea rescue plucked him to safety from a life raft on 21 May. Now Donald Crowhurst - the last man afloat now that Knox-Johnston was home - was going to take the £5,000 prize for the fastest circumnavigation. The de facto winner, he would come home to face the inevitable scrutiny of race officials and yachting correspondents. Crowhurst's lies had helped sink Tetley, now - in June, the final month of the race - the same lies returned to drive him to the edge of a breakdown. "He went downhill after he heard the news of Nigel Tetley," comments Simon Crowhurst, sadly. On board the Teignmouth Electron, the Marconi transmitter had finally conked out. Crowhurst could receive incoming news, but he couldn't communicate with the outside world. He was alone with the self-inflicted fiction of his voyage. On a boat clogged with the weeds and jellyfish of the Sargasso Sea, his imagination was driving him to the brink of madness. "It's a psychological maelstrom that can drag you down." In particular, he is unnerved by Crowhurst's final record, in the ship's log books. "I'm wary of the log books," says his son. "My wife doesn't like me thinking about them. They have a bad effect on me." The log books, which had begun as a mundane record of a circumnavigation, had become the disturbing repository of a cumulative lie, the painstakingly contrived details of a false voyage. Now, in these final weeks, they became a more terrible document: the record of a mind at the end of its tether, 25,000 words of confessional philosophising and deranged speculation about the nature of the cosmos in which he, Donald Crowhurst, saw himself as the son of God. "It is finished," he wrote on the final page. "It is finished. IT IS THE MERCY... I will resign the game." It was 1 July 1969. At this point, a bizarre hoax becomes the stuff of myth as much as literature. On 10 July 1969, the Royal Mail vessel Picardy, steaming through the mid-Atlantic towards the Caribbean, encountered a yacht, drifting under a single sail, like the Marie Celeste. The Teignmouth Electron was cluttered and untidy, with dirty dishes and filthy bedding, but of her crew there was no sign. The mystery of Crowhurst's disappearance made him famous worldwide, though not in a way he would have wanted. There were reports of Crowhurst sightings from Cape Verde to Barnstaple. Simon recalls the British media staking out the family home in the hope of news about the "mystery man". For the Crowhurst family, the reality was more tragic. "At first," he remembers, "we were told he had just disappeared. Then one day two nuns came to the house. My mother said: 'The boat's been found, but he's not on it.'" The children huddled upstairs in a bedroom. "We knew something was very badly wrong," Simon recalls. Clare, who had so bravely held the family together for months, began to break down. Two days later, the log books began to yield their secrets. The air-sea rescue was called off. Simon, his brothers and sister were left to puzzle over a new mystery. Why was no one looking for their father any more? For years after, Clare Crowhurst could not bring herself to discuss the loss of her husband, or his embarrassing hoax. A great, and painful, silence descended. This is just one element of the Crowhurst mystery. To extract maximum publicity from the sensational story of the "Missing Yachtsman", the Sunday Times sent one of its top correspondents, Nicholas Tomalin, to interview the captain of the Picardy, inspect the Teignmouth Electron and collect whatever papers had been found on board. Instead of a thrilling front-page story, they got the embarrassing tale of the amateur yachtsman who had fooled Fleet Street. Tomalin turned an awkward moment into a sensational scoop. With co-author Ron Hall, he now raced against the clock to unravel the mystery of the log books and publish The Strange Last Voyage of Donald Crowhurst, widely regarded as the definitive account. Simon Crowhurst, who works as a research technician in the Earth Sciences department of Cambridge University, wonders if he should not make a pilgrimage to see the Teignmouth Electron, still beached amid weeds and driftwood on the dunes of Cayman Brac in the Caribbean, and said by the locals to be haunted. He feels the curse of the past. "When I was a small boy, I was excited by my father's story. Then it became quite visceral, upsetting and exciting. When I was about 16, I read the Tomalin-Hall book. That was a bizarre experience. At first there was a terrible revulsion. I didn't talk to anyone. I just absorbed it." There is another dimension to this tale, rarely explored. Having spoken at length to Simon, I went to visit his mother, Donald's widow, Clare, at her seaside home on the Jurassic coast, some 20 miles from Teignmouth, for a very rare interview. "I definitely think about Donald every single day," she says, almost before I am inside the house, a gloomy, cluttered Victorian pile at the end of a terrace behind the Seaton seafront. "No, I don't talk to him," she says. "I genuinely feel that that's it - there really is nothing left." All this comes out in a rush, but, once the conversation settles down, Clare concedes that she "used to be angry with Donald", as well as angry with herself. "It was a terrible thing to do to the children." Could she have worked harder to stop her husband from sailing? "You know, I never thought he would raise the money. Then he was so full of excitement. Of course I wish I'd said, 'Don't go.' But at the time I thought he was doing the right thing - I was not being brave, but being loyal to his dream, as a wife." Her main regret is that she did not take more control of the story. "If I'd had my wits about me, I'd never have released the log books." She has consistently set her face against publicising the story. "Nic Roeg [the film director] used to buy me dinner regularly. Roeg thought he was very charming. But I couldn't agree." She has wanted to keep the tragedy to herself, at a considerable cost. "I've lived on very little money these 40 years," she says, sadly. "I've muddled through. I still feel as if I'm muddling through. There are moments when I do feel extraordinarily happy, but then I feel guilty about it." She has known some other terrible moments. Ten years after Crowhurst disappeared, her eldest boy, James, was killed in a motorbike accident. Now, in her 77th year, Clare Crowhurst seems at peace. "There it is," she says, having shown me the famous log books. "I still feel as if it could all have been yesterday, or last week." Has she never thought of emigrating to Australia (where she owns property) or remarrying? "After it happened, I was just another mum, really. I was pursued for a while by one or two locals, but I really wasn't interested. Something died with Donald."